As fall settles in to New England, we've been doing more projects around the house and more crafts in general. Margot has become obsessed with the idea of making things to wear. * She apparently needs a new pair of shoes, so she has made herself some. 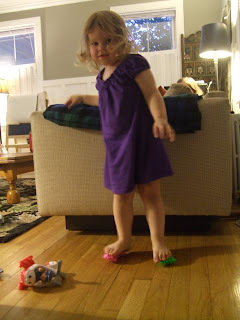 This model is made from bristly blocks, pink and green, that were carefully engineered to be the length of her feet. She likes to wear two different shoes in general, so I think that the mismatched colors were on purpose. They don't stay on well and really only work on the floor (not the rug), but she's very happy with this prototype. * Her first question about any article of clothing is "who made this for me?". I love that!